Gospel music as an important form of Christian hymnody had its be¬ginning in the latter half of the nineteenth century and is associated with such well-known names as Moody, Sankey, Bliss and Frances Jane Crosby. Crosby, perhaps more than any other writer, however, truly captured the spirit of the American gospel song movement. As one author has written, “Gospel hymnody has the distinction of being America's most typical contribution to Christian song. Gospel hymnody has been a plough digging up hardened surfaces of pavemented minds. Its very obviousness has been its strength. It is the music of the people.” Robert M. Stevenson-Patterns of Protestant Church Music. It is estimated that Fanny Crosby wrote more than 8,000 gospel song texts in her lifetime. Her hymns have been and are still being sung more frequently than those of any other gospel hymn writer. Her many favorites have been an important part of evangelical worship for the past century. It is truly amazing that anyone, and especially a blind person, could write on this variety of spiritual truths and experiences with such proliferation. For a considerable period during her life, while under contract to a music publisher, she wrote three new hymns each week. She used over 200 pen names besides her own. Many of her original texts are still being uncovered and no doubt will be published in the near future. Often the themes for her hymns were suggested by visiting ministers wishing to have a new song on a particular subject. At other times musician friends would first compose the music and then ask Fanny Crosby for the words. Such was the case for the hymn, "Blessed Assurance." The music for the hymn was composed by Mrs. Joseph Knapp, an amateur musician, wife of the founder of the Metropolitan Life Insurance Company, and a close personal friend of Fanny Crosby. One day Mrs. Knapp played this melody for the blind poetess and asked. "What does this tune say?" Fanny responded immediately, "Why, that says: 'Blessed Assurance, Jesus Is Mine.'" Mrs. Knapp published more than 500 gospel songs herself, including the popular gospel classic, "Open the Gates of the Temple." Fanny Crosby died at the age of ninety-five. Only eternity will disclose the host of individuals who have been won to a saving faith in Jesus Christ or those whose lives have been spiritually enriched through the texts of her many hymns. 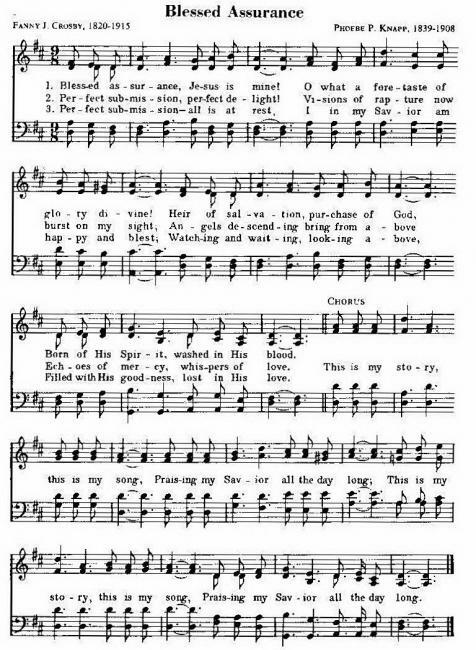 Other hymns by Fanny J. Crosby include, "All the Way My Savior Leads Me" (No. 5), "My Savior First of All" (No. 60). "Rescue the Perishing" (No. 76), and "Saved By Grace" (101 More Hymn Stories, No. 76).